The trailer started life in 1996 as the steel cradle seen here at left. 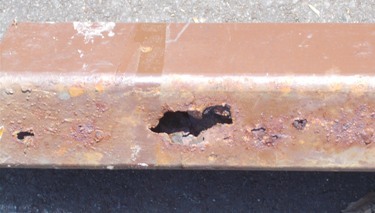 It was very well built with little sign of serious rusting. After sandblasting her, we welded a short tongue to the frame and bought, through the Northern Tool and Equipment catalogue, a single axle, surge brakes, springs, fenders, hitch actuated hydraulic surge brakes, heavy duty tires, a spare tire, a light package and an 800lb capacity tongue jack, the one in the picture immediately below, It was marginal. 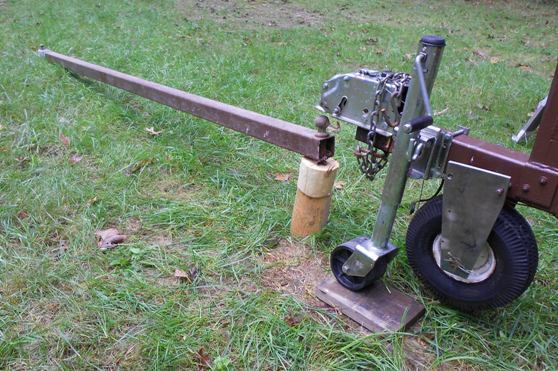 In 2008 we bought a new, double wheel 1500 lb jack - much better. The tricky part of building the trailer was getting the location of the axle right so we could achieve the right balance and tongue weight. This involved some assistance from the S&S office - fore and aft center of balance (see sketch below). Some real nice, expensive hitches have load cells that read out the tongue weight on the truck hitch. This does not fit within the typical Dolphin owners accessory budget. The assembly of all the parts is fun as long as you have a mechanic friend who knows about things like hydraulic surge brakes. 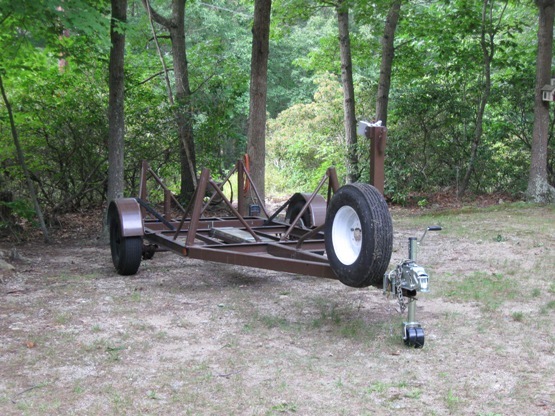 We have a 12’ extension and a removable tongue wheel (click here for a larger image of picture at left) that makes launching easier. The wheel stores on top of the tongue. If I recall correctly, that tongue wheel was a wheel barrow wheel I picked up at Home Depot. 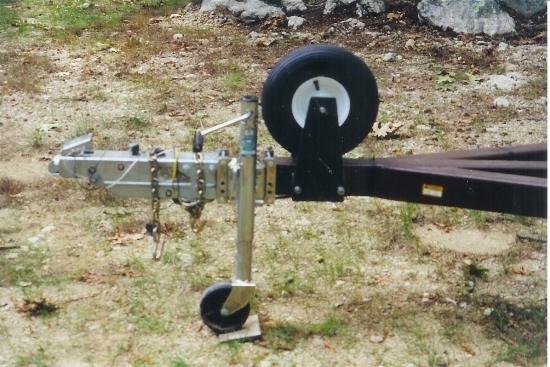 After positioning on the ramp, the trailer wheels are blocked, the trailer disconnected, the tongue wheel moved to the down position and the jack swung up. The extension is connected to the hitch on the trailer and on the truck. With this one axle system you have to be sure you have your weight distribution right, not only for towing, but when using an extension, especially on a steep ramp. A 'light' tongue is not good - I think 500# minimum and 800# maximum is the right range. Another problem with a light tongue - with the extension rigged - backing down a nice gentle, beautifully paved ramp is no problem. With the extension, if the backing down process is jerky or stops abruptly (pot holes, bumps, etc.) 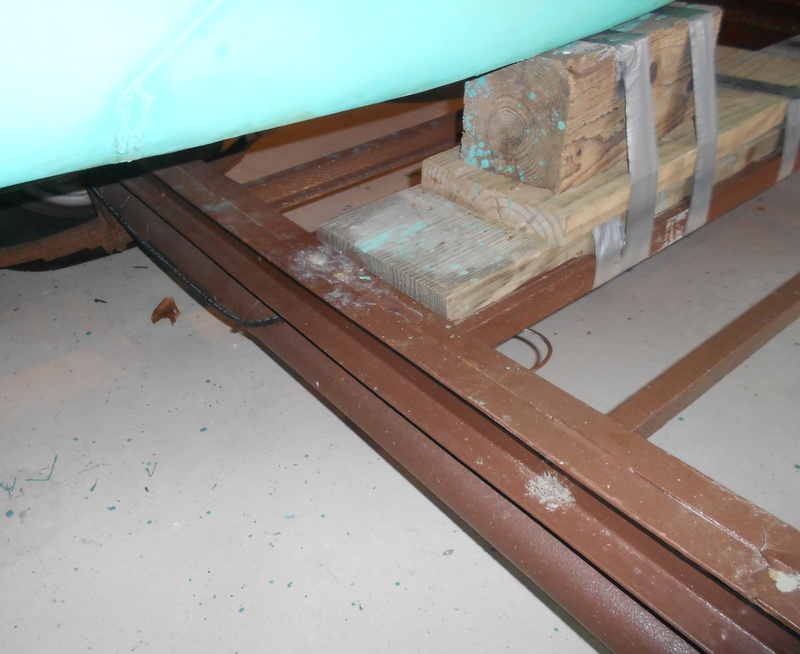 the tongue "joint" could lift because the boat wants to keep going while the trailer wants to stop.. Not a big problem when the boat's stern is nearly in the water, but a big problem if on the steeper, dry part of the ramp, or in shallow water. This owner has, many times, put his 200 lbs (update 175#s!!) to good use as insurance by standing on the tongue over the extension wheel for the ride to deeper water. (October 6, 2011 - see more on this subject below) Maybe this is why people invest in double axle trailers? Another consideration is that a short tongue means no really tight turns. More on why a short tongue is a good idea later. 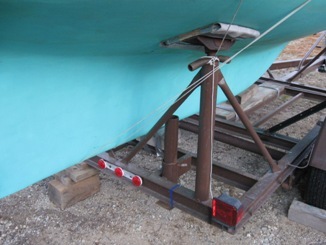 The trailer has a removable 'nose' post to help align the boat when she is being pulled out. This can be a bit tricky without a winch to hold her on nose as the boat will settle in whatever attitude she has when she no longer floats - this is a variable event by poppet depending on how level and even the ground under the water is. Putting a ring in Marionette's bow is not an option! You can't use a line to the bow chock because while it pulls the bow down into the nose post it also pulls the stern up - and when you haul out the stern settles back pulling the the nose back. Sometimes we use a halter around the whole boat so there is no down pressure on the bow. It really all depends on the attitude of the trailer and how gradual the grade is. Anyway, we always manage to get it done and get her home, sometimes with a pad that we slip between the nose post and the bow. In any event, the nose post is not 'structural', only a sturdy guide. The trailer passed the Connecticut Motor Vehicle Dept. inspection and has a 6000lb rating. She weighs 1060 lbs which means that she is rated to carry a 4940 lb load. What does a Dolphin weigh? I thought you would never ask (click here) Total cost was less than $2000 plus lots of mental stimulation vs the Triad no brainer but expensive $3300, at that time (1997), now maybe close to $6000. The real savings? Marionette's trailer can fit in a barn that is only 28’ deep. 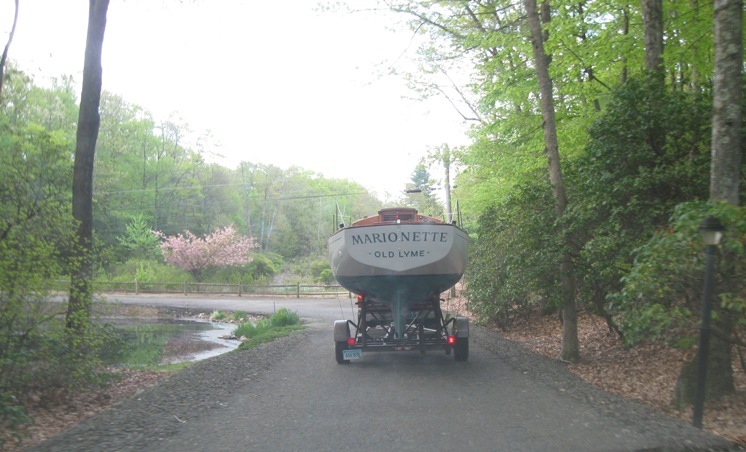 The overall length of this trailer with boat is 26’. A Triad with boat would be about 8’ longer, at least several thousand in additional, larger barn, construction costs on land that I really could not spare. The trailer in the barn. That 2 x 4 in the foreground was an early temporary brace for the vertical nose support you see in the prior photo. The 2x4 was replaced by a removable 1 1/2" OD pipe with U flanges welded to both sides and bolted to the tongue. Click here for a larger image of the picture at left. In the beginning I had built a pair of wood guides for the keel thinking they would help guide the boat on to the trailer. And I bolted a couple of aluminum tubes to the fenders into which thin flag poles could be inserted. Neither of these 'accessories' turned out to be necessary. 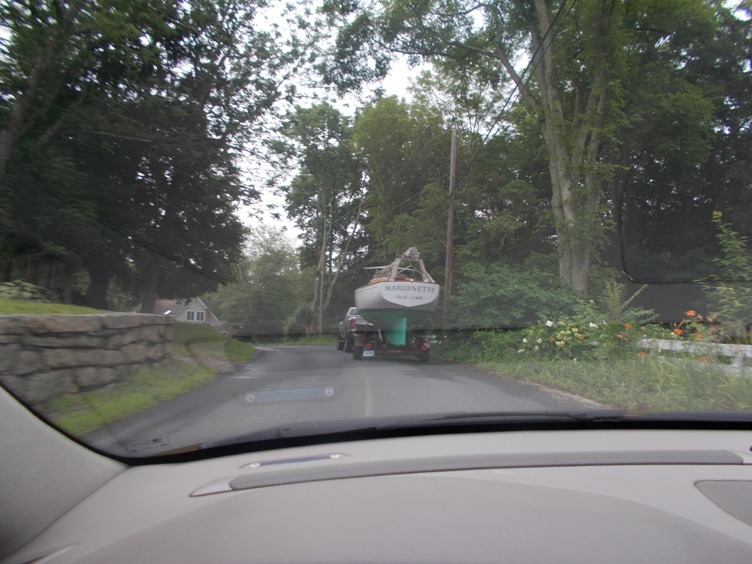 On September 9, 2008 this trailer made its first ever long haul - 250/275 miles from Southport Is/Boothbay, Maine back to Old Lyme, CT. This trip was approached with some anxiety. She came through with flying colors. I learned one lesson about trailering a heavy load at 65mph on the highway - do not look at the trailer - its scary. Kind of like an out of control dinghy being towed in a following sea... Here, below, she is delivering Marionette safely back to her barn. Please note that the trailer lights still work! Some comments on the mast issue. 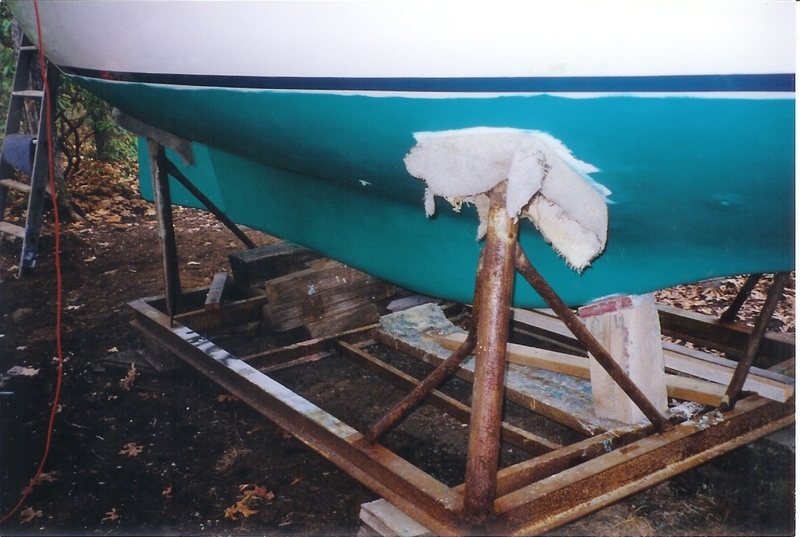 When I built the 'saw' horses for supporting/carrying the mast on the boat, I had a couple of things in mind - clearing the bow pulpit, high enough so that I could use them with the mast as a ridgepole system for a winter cover should the need arise, low enough to clear bridges, and a reasonable height so I could use them as horses for working on the mast for normal maintenance. We had no problems with this system but if these horses were lower the center of gravity would be lower - a good thing, and easier to load. And thinking about all the large dents you see in steel bridge trusses on the highway would no longer fog the mind. January 23, 2010 The recent interest in trailers has prompted a review of what additional useful information on Marionette's cradle conversion was available. A key piece of information is knowing the exact center of gravity formula for the Dolphin 24. Here is the formula provided by S&S: The center of gravity is located at 50.55% of the waterline length measured from the bow. Here is a rough sketch used when we built Marionette's trailer. 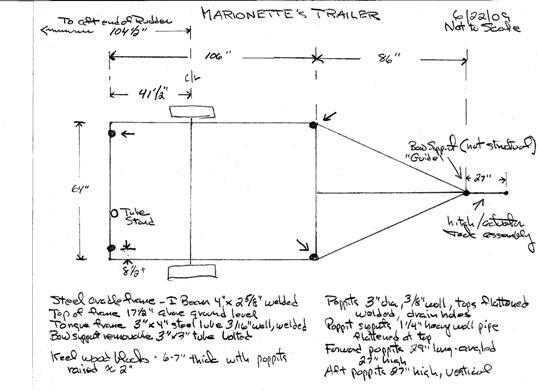 The measurement formula placed the center of gravity inline with the center of Marionette's aft portlight, which is also a point 11' from the end of the transom - why I considered this relevant I can't remember. When I bought the boat it was on the cradle positioned with the front poppit lined up with the running light (which is just forward of the main bulkhead), and in line with the winch. The boat had been in this position for nearly 10 years without change and there was no visible hull deflection. There did not seem to be any good reason to change this so the next step was to position the single axle under the cradle to get the desired tongue weight. The easiest reference point on the boat was the end of the rudder - I remembered that. The following sketch shows the position of the axle. it also indicates the height of the poppit's and other important dimensions. 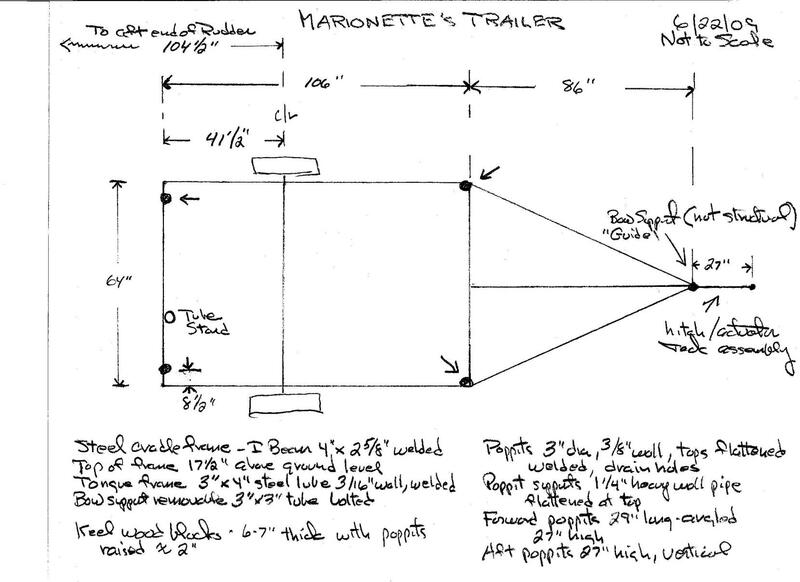 This is a sketch of the key dimensions on Marionette's trailer. By viewing the trailer itself (above) and checking against this sketch you can dimension the trailer. For a larger view of this sketch click here. Click the back arrow on your browser to get back here. 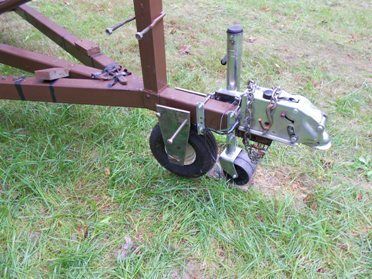 > Dutton - Lainson 800 single wheel tongue jack; later upgraded to 1500 lb double wheel the 800 lb jack seemed 'tired", and I wanted the double wheel for ease of moving the nose of the trailer around on softer ground. > Tires - Titan SD 225/75, 15", 6 lug, 2500lb capacity. I have a 'short' tongue because I needed to get the boat/trailer into a barn without much room. It works but you have to watch for sharp turns, and I think a longer tongue might tow better. I am happier with a 1500lb capacity tongue jack. I am on my 3rd full/partial set of trailer lights in 12-13 years? 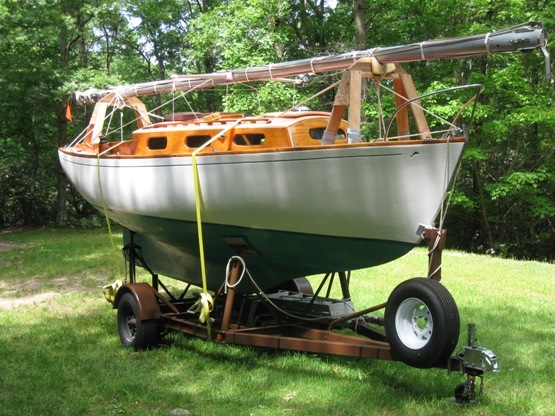 Generally, I launch and retrieve the boat at a salt water ramp once a year, spring and fall. I always fresh water rinse but....The next time they go out on me due to corrosion I am going to rip off the entire system and replace it with a 'temporary' system - essentially an easily detached (from the trailer frame) 2x4 with the lights fixed to it and wires that clip to the frame. When the trailer goes in the water, the lights and wires come off. For the same reasons I would be careful about electric brakes. July 23, 2011. Recent developments suggest an update the this page is in order. 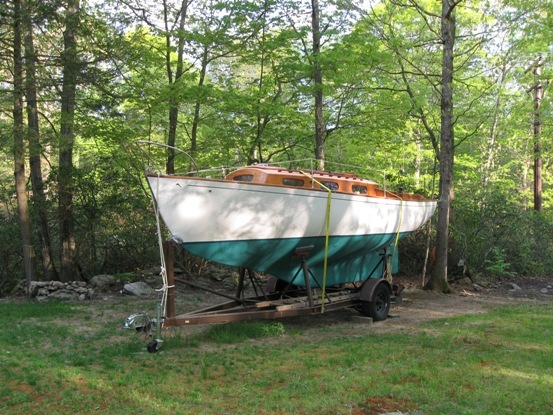 Early this year I decided to keep Marionette up in Maine for the summer and fall of 2011, perhaps winter her there and have two consecutive sailing seasons up there. 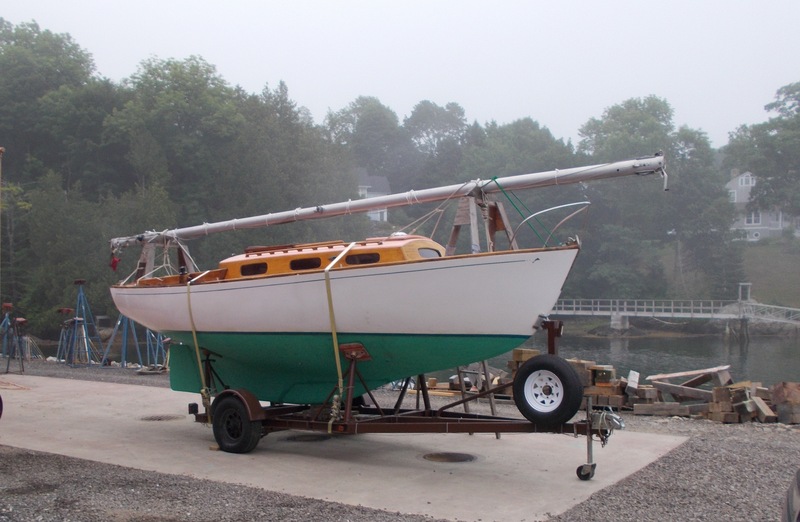 And, instead of sailing up - about 7 days - as I had on 2 previous cruises, I decided to trailer the boat up to Rockland, Maine and launch her there. Its a 300 mile road trip, 250 at turnpike speeds with 6000lbs of boat and single axle trailer pushing you forward. I had Marionette's trailer serviced and I painted it so she looked good. 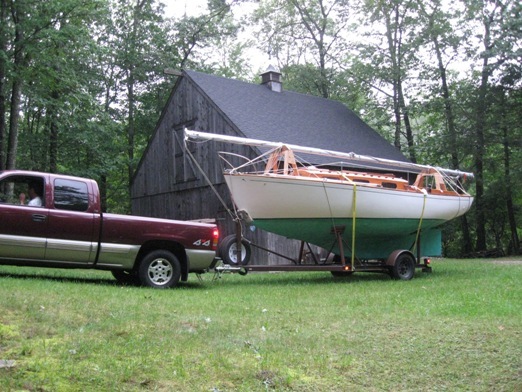 That trailer had made the trip from Boothbay, Maine home with Marionette 3 years years ago with no problems, but I confess to have more nervousness about long distance trailering than long distance sailing. 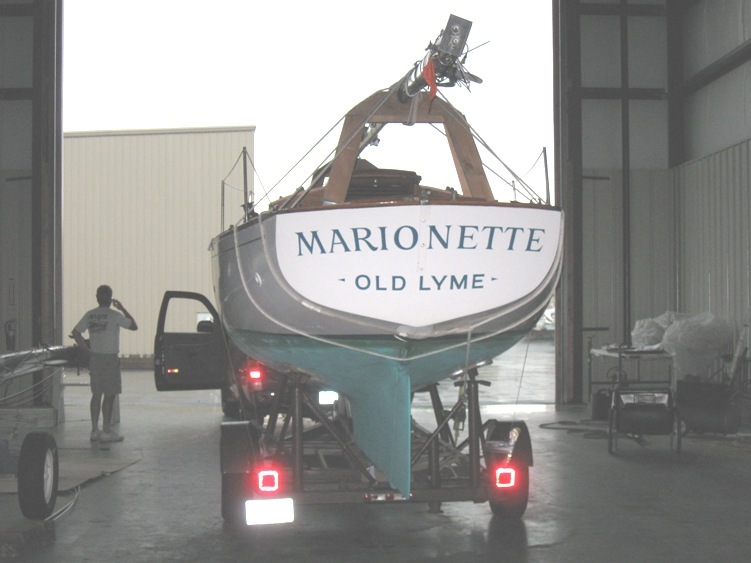 Here is Marionette ready to go June 15, 2011. For a look at Marionette's Log, Summer, 2011 click here. Premonition is one reason why I am uncomfortable with long distance trailering. We had a good trip - nearly 300 miles and no problems. Six miles before we got to Rockland there was an incident. An accident up ahead closed Route #1 and we were detoured off on to a side road where we sat for nearly an hour. This was a opportunity to walk back and check the trailer straps and so I did. While doing this I noticed a strange black smudge? on the starboard side of Marionette and went back to the truck to get some towel paper. Then I noticed that the right fender bracket was loose, actually broken. The fender already had a dent in it, (look closely) from a too tight turn I took out of my driveway on my way to get the trailer serviced a couple of weeks earlier. On closer examination, mostly out of view, I noticed that a piece of the tire tread was missing ...missing?? The piece missing was about the size of my hand. The tire was fully inflated but I could see the nylon? inner bands that encased the tire inside the treads. This must have just happened! Knowing we dodged a bullet (the single axle bullet) we changed the tire with the brand new, never used, spare (15 years old). The tires on the trailer probably did not have 1000 miles on them - but they too were 15 years old. In the heat of the moment I forgot to take pictures, and I know this will get me in trouble with the webmaster. 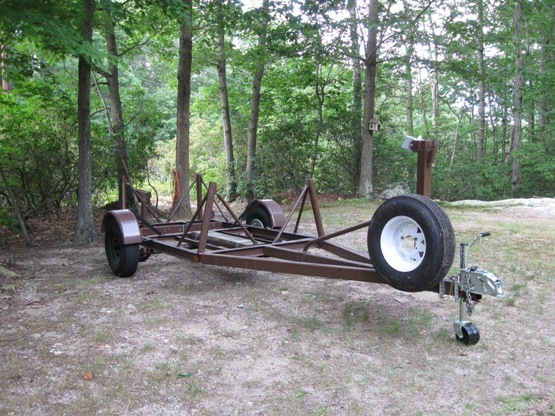 After launching Marionette we took the trailer to a local tire shop in Rockland, bought a new tire and put it on the trailer on the port side, and put that tire on the spare rack. The shop guy told us that the piece that 'flew' out of the tire was probably due to the heat and age deterioration of the tire, not to any road hazard, and certainly not to wear. The unloaded trailer made it back to CT without problems - and is now at my local trailer shop scheduled to get another new tire to replace the 'new' 15 year old never used spare tire, and a complete re-inspection. Specs on the new tires: Goodyear Marathons ST 225/75 R15, load range D, 2540 lbs; 65 psi; Radial 5 ply, 2 steel, 2 polyester, 1 nylon, tubeless. This is a 'mock up". You'll just have to believe me. This picture taken outside the barn. 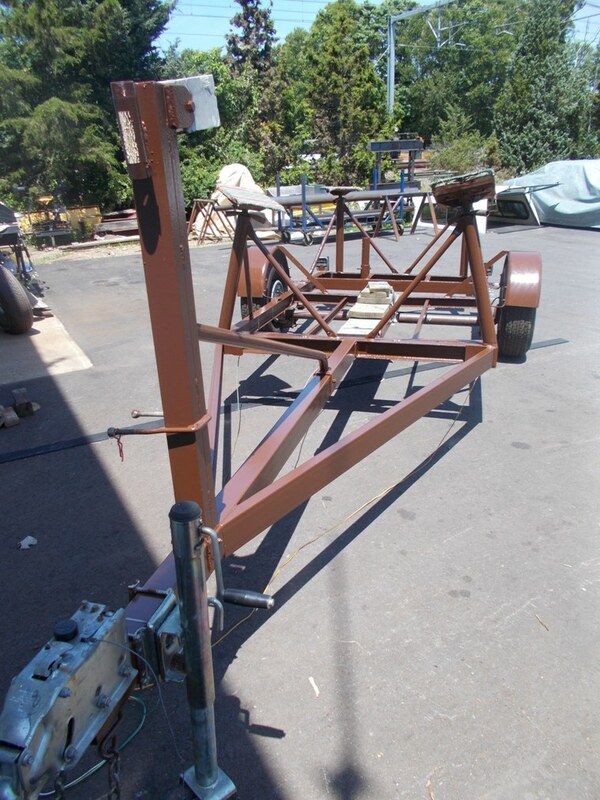 The boat ramp set up is as follows: the trailer wheels are blocked, the nose wheel installed beneath the tongue and the bolts tightened. The jack wheel is raised to get the hitch off the truck, then lowered to get the weight on the nose wheel, then the jack is tilted back. 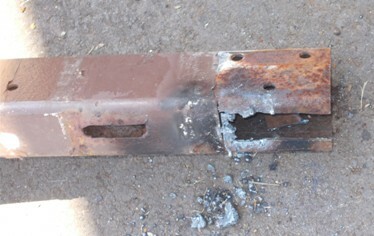 The 12' extension male end is fitted to the trailer hitch and the female end to the truck. The owner, if necessary, steps up on the tongue, and we back down the ramp. The tongue wheel in the 'working position - uses same mounting holes in the tongue. You stand on the top of the tongue over the wheel and hold on to the strut. The additional weight may needed on variable grade or steep, bumpy ramps. The U-bolt is for mounting the real spare if going on a long trip. January 17, 2013. Your webmaster has not been able to get the Admiral to approve a pickup to tow Marionette so this gets done by a good friend and his truck. We have been 3 times to Maine - 500+/- mile round trip, plus 20+ times up and down local launching ramps and boat yards. Here are the specs. October 11, 2013. A question came in over the transom about the tongue wheel specs (see picture above left). The wheel was bought maybe 12 years ago, is a Carlisle wheel barrel? 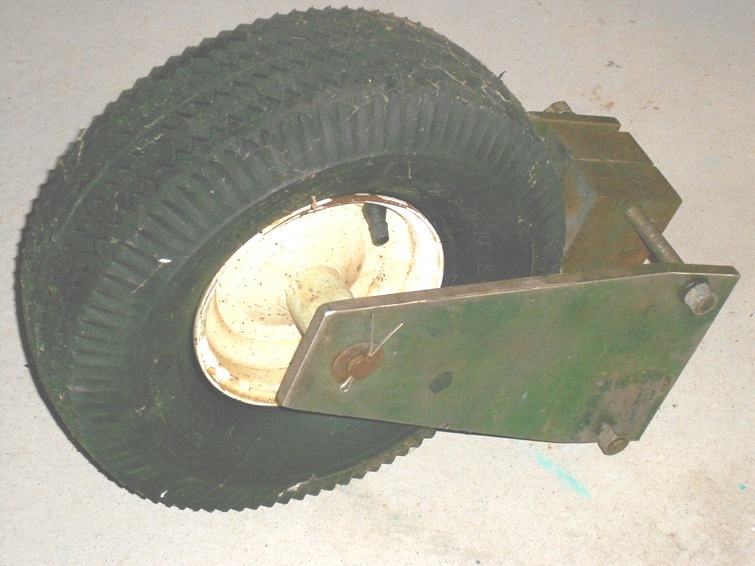 inflatable tire, steel wheel - about 13" in diameter, 4 1/2 inches thick, - the numbers on the tire say 5.30/4.50, 6 ply rating. The wheel axle diameter is 5/8". The plates used to mount the wheel are 3/8" thick steel. The bolts to fasten it to the trailer tongue are 1/2" dia. The spacer blocks are steel and are used to vertically position the plates on the tongue at a spacing equal to the axel length. The dimensions will vary based on the particular dimensions of the trailer tongue. 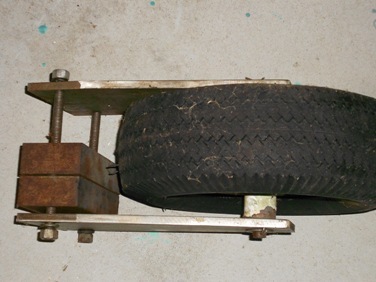 The wheel/tire system needs to be able to support the tongue weight of the loaded trailer (800lbs) plus the 200lbs of the guy standing on it (total 1000lbs) - as mentioned above the weight of the guy may be needed to prevent any unexpected upward buckling at the trailer tongue and extension joint when moving down the ramp. 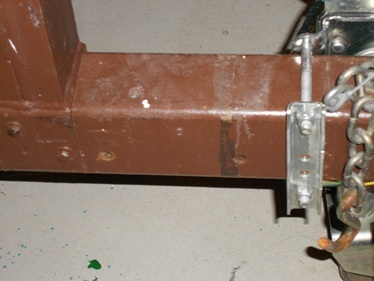 March 6, 2016 We have been working on updating Trailers in the Technical section and we needed some better pictures of Marionette's trailer setup - particularly the support system for her 'keel bed". Here they are. Click on the photos for larger images. 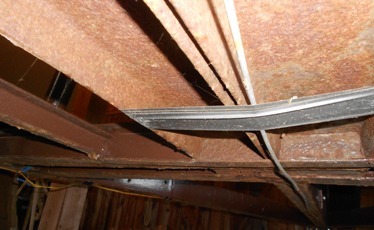 At left is an underneath photo which gives some idea of the structure under the trailer keel bed. 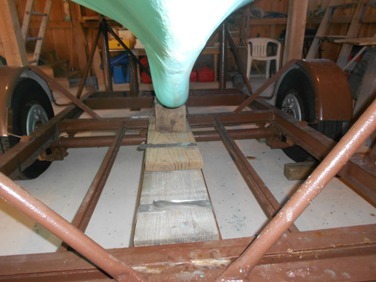 Wish we had a photo before we put the 2x6 board on top of the keel bed support grid - and the boat's keel on top. 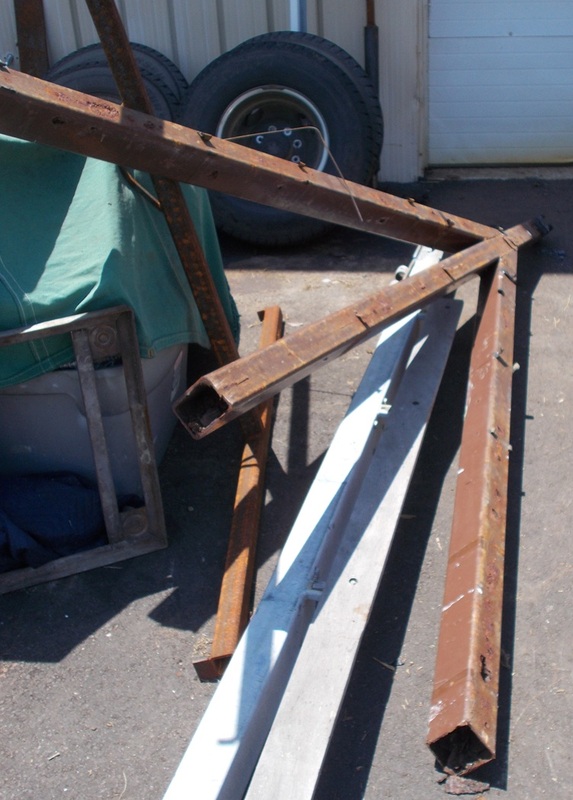 It will be a couple of months before the trailer is 'free'. .
Based on advice from people who know this stuff decision was made to make the new neck using "C Channel" steel for the outer pieces and a steel tube for the center piece. Pictures continue to be worth 1000+ words so here is a close up of the old tube section. August 5, 2017. No problems on the trip!! 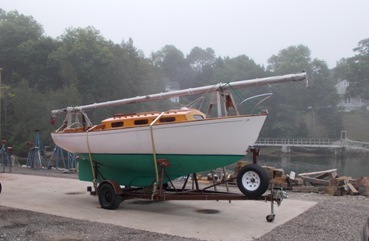 Here she is at Rockport Marine up in Maine - strapped and ready to go on the return trip - Click here for a larger image. And she made it back - no problems.